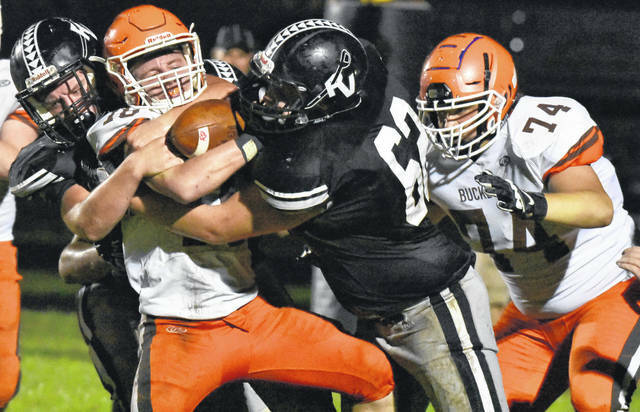 RVHS Jacob McGhee (62) makes an assisted tackle during the Raiders 54-28 setback to Nelsonville-York in a Week 4 TVC Ohio contest in Bidwell, Ohio. Last Week: Eastern defeated South Gallia 14-13, in Tuppers Plains; Wahama defeated Federal Hocking 50-22, in Stewart. Last meeting between the teams: Oct. 6, 2017. Eastern won 33-12 in Tuppers Plains. Current head-to-head streak: Eastern has won 1 straight. EHS offense last week: 137 rushing yards, 129 passing yards. WHS offense last week: 332 rushing yards, 65 passing yards. EHS offensive leaders last week: QB Conner Ridenour 12-of-18, 129 yards, 2TDs; RB Blake Newland 18 carries, 72 yards; WR Isaiah Fish 3 receptions, 46 yards. WHS offensive leaders last week: QB Abram Pauley 3-of-5, 65 yards, 1TD; RB Brady Bumgarner 11 carries, 88 yards, 2TDs; WR Brayden Davenport 1 reception, 28 yards. EHS defense last week: 172 rushing yards, 56 passing yards. WHS defense last week: 161 rushing yards, 46 passing yards. 1. The all-time series record between these teams is 33-9 in favor of the White Falcons. The road team has been victorious in five consecutive years, with Eastern winning 34-20 in its last trip to Bachtel Stadium, on Oct. 7, 2016. 2. Both teams earned their first win of the season last week. Four different White Falcons found the end zone to highlight Wahama’s win. Eastern’s defense came up with a trio of interceptions to help seal its first victory of the year. 3. Eastern’s last three touchdowns have been of the passing variety, with the Eagles’ lone rushing score of the year coming in Week 2. Only one of Wahama’s 10 touchdowns has been on a pass play this season. 4. Wahama and Eastern are joined by Miller and South Gallia as Tri-Valley Conference Hocking Division teams with one win through five weeks of play. Federal Hocking remains the lone winless squad, with the other four schools entering the second half of the season with a winning record. 5. WHS enters the week tied at 36th with Hundred and Greenbrier West in the WVSSAC Class A ratings. EHS is ranked 15th in OHSAA Region 27, the highest rated of all one-win teams. Last Week: South Gallia lost to Eastern 14-13, in Tuppers Plains; Southern lost to Belpre 55-41, in Belpre. Last meeting between the teams: Oct. 20, 2017. Southern won 48-0 in Mercerville. SGHS offense last week: 172 rushing yards, 56 passing yards. SHS offense last week: 136 rushing yards, 262 passing yards. SGHS offensive leaders last week: QB Tristan Saber 7-of-15, 56 yards, 3INTs; RB Kyle Northup 12 carries, 74 yards; WR Jared Ward 4 receptions, 34 yards. SHS offensive leaders last week: QB Logan Drummer 16-of-25, 262 yards, 4TDs; RB Trey McNickle 8 carries, 130 yards, 2TDs; WR Weston Thorla 6 receptions, 85 yards. SGHS defense last week: 137 rushing yards, 129 passing yards. SHS defense last week: 272 rushing yards, 50 passing yards. 1. The Tornadoes are 12-9 against SGHS in all-time meetings, including 5-3 in TVC Hocking play. South Gallia’s last trip to Racine resulted in a 52-14 SHS victory. 2. Last Friday, the Tornadoes surpassed 40 points for the fourth straight game. The 55 points allowed by the Purple and Gold is the most since giving up 62 to Symmes Valley in 2012. 3. Along with a one-point loss last week, the Rebels have also dropped a two-point decision this season. SGHS was involved in just one one-possession game a year ago, with its last one-point game coming in Week 1 of the 2015 season. 4. The Rebel run game has accounted for 1,122 yards of the team’s 1,347 yards and 10 of the team’s 11 touchdowns this season. Meanwhile, Southern has rushed for 877 of its 1,680 yards and scored 13 of its 28 offensive touchdowns on the ground. 5. The Purple and Gold enter Week 5 at 8th in Region 27 rankings, while Red and Gold are currently 22nd. SHS is one of five four-win teams in the region, while the SGHS is joined by six other schools with one win. Last Week: Fairland defeated Rock Hill 42-35, in Pedro; Gallia Academy defeated Portsmouth 34-7, in Portsmouth. Last meeting between the teams: Sept. 30, 2016. Fairland won 49-34 in Gallipolis. Current head-to-head streak: Fairland has won 2 straight. FHS offense last week: 160 rushing yards, 336 passing yards. GAHS offense last week: 333 rushing yards, 89 passing yards. FHS offensive leaders last week: QB Joel Lambiotte 16-of-22, 336 yards, 4TDs; RB Joel Lambiotte 13 carries, 75 yards, 2TDs; WR Reilly Sowards 8 receptions, 108 yards, 2TDs. GAHS offensive leaders last week: QB Justin McClelland 6-of-19, 89 yards, 1TD; RB Lane Pullins 18 carries, 107 yards; WR Cade Roberts 3 receptions, 51 yards. FHS defense last week: 412 rushing yards, 5 passing yards. GAHS defense last week: 164 rushing yards, 27 passing yards. 1. Fairland’s last trip to Gallipolis was the inaugural Battle for the Old Coal Bucket on Sept. 30, 2016, and resulted in a 49-34 Dragons victory. 2. A week ago, the Blue Devils hit the 400-yard mark for the third time this season. It was also the third time GAHS has reached 330 rushing yards. Last week was the second time that the GAHS offense held an opponent below 50 yards passing. 3. Fairland’s Joel Lambiotte is the current Ohio Valley Conference leader in all passing categories. Through five games, Lambiotte has completed 84-of-141 pass attempts for 1,395 yards with 17 touchdowns and just two interceptions. 4. In total this season, GAHS has outscored opponents 191-to-62, including 103-to-33 in the first half. Fairland has outscored its first five opponents by a combined 169-to-151. 5. In the Region 15 playoff ratings, Gallia Academy is currently fourth and is one of six teams with at least four wins. Fairland is one spot behind the Blue Devils and is the highest ranked of the five three-win teams in the region. Last Week: Wellston defeated Alexander 49-7, in Wellston; River Valley lost to Meigs 42-21, in Rocksprings. Last meeting between the teams: Sept. 29, 2017. Wellston won 28-7 in Wellston. WHS offense last week: 422 rushing yards, 148 passing yards. RVHS offense last week: 147 rushing yards, 63 passing yards. WHS offensive leaders last week: QB R.J. Kemp 5-of-7, 148 yards, 2TDs; RB Jonathon Garvin 6 carries, 107 yards, 1TD; WR Rylan Molihan 2 receptions, 84 yards, 1TD. RVHS offensive leaders last week: QB Jordan Burns 5-of-11, 63 yards, 1INT; RB Trevor Simpson 21 carries, 117 yards, 1TD; WR Jared Reese 3 reception, 45 yards. WHS defense last week: 33 rushing yards, 77 passing yards. RVHS defense last week: 185 rushing yards, 127 passing yards. 1. The home team has won back-to-back games in this series, after the road team had won back-to-back in the two previous years. RVHS won 14-6 the last time these teams met in Bidwell, with the Golden Rockets’ last win in Gallia County coming by a 33-32 count in overtime in 2014. 2. The 185 rushing yards and 312 total yards allowed by the Raider defense last week both serve as season-bests. The RVHS defense also came up with a season-high three turnovers last Friday. 3. Last week, the Rockets ended a two-game scoreless drought with its highest scoring output since scoring 50 against Alexander in Week 5 of 2017. 4. So far this season, River Valley has rushed for six of its eight touchdowns and carried the ball for 717 of its 968 total yards. A dozen different Raiders have toted the rock this season. 5. Wellston is currently 14th in the Region 19 rankings, which includes six two-win teams. River Valley is one of five winless teams tied for 22nd in Region 19. Last Week: Meigs defeated River Valley 42-21, in Rocksprings; Nelsonville-York lost to Waverly 31-14, in Waverly. Last meeting between the teams: Sept. 29, 2017, Nelsonville-York won 49-14 in Rocksprings. MHS offense last week: 185 rushing yards, 127 passing yards. NYHS offense last week: 90 rushing yards, 129 passing yards. MHS offensive leaders last week: QB Coulter Cleland 10-of-16, 127 yards, 2TDs, 2INTs; RB Zach Bartrum 12 carries, 96 yards, 2TDs; WR Weston Baer 4 receptions, 58 yards, 1TD. NYHS offensive leaders last week: QB Tyson McManus 9-of-20, 111 yards, 3INTs; RB Colton Snyder 31 yards; WR Brandon Phillips 4 receptions, 66 yards. MHS defense last week: 147 rushing yards, 63 passing yards. 1. Nelsonville-York holds a 23-14 record against Meigs in the all-time series, which began in 1967. The Maroon and Gold suffered a 47-6 setback the last time they visiting Nelsonville, on Sept. 30, 2016. 2. In addition to four offensive touchdowns, the Marauders scored once on defense and once on special teams last Friday. Ty Bartrum’s interception return for a touchdown last week was Meigs’ second defensive score of the season. 3. The Buckeye offense didn’t produce a touchdown last week, but Walker Elliott found the end zone twice for NYHS, first on a 98-yard kickoff return, and later on an 82-yard interception return. 4. The MHS offense has thrown for 1,008 of its 1,513 yards this season, along with 12 of its 22 total touchdowns. Through five games, Meigs has completed 68-of-125 pass attempts, with five interceptions. 5. The Marauders enter Week 6 at 17th in the Region 15 rankings, while the Buckeyes are 23rd in the Region 23 rankings. Meigs is one of 15 teams in its region that enter the week below .500, while NYHS is one of four one-win teams in its region.